"To know Ma, was to love Ma." These are the words my sister wrote in an extended obituary that was read at the funeral. They reflect the feelings of everyone who knew Ma; she was so easy to love. She was warm and open, caring and honest. She was also unselfish, kind, strong, sweet and funny. She never forgot birthdays or anniversaries. Her door was always open and if you stepped into her house, you would find yourself loved (and fed). Before you left, you would always get a hug and an "I love you". 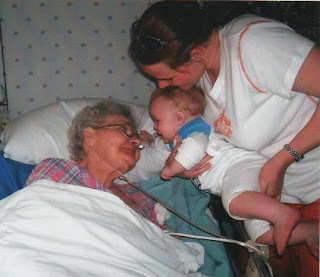 Ma was very sick for a long time before she passed. 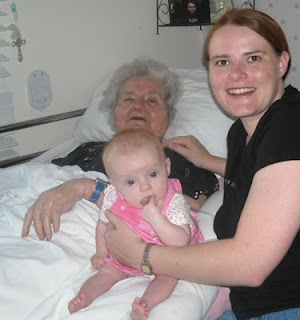 She spent her last few years in a nursing home where she was visited daily by friends and family. Unfortunately, I was not a frequent visitor because I live so far away. Therefore, I didn't get to spend as much time with Ma as I would have liked. As the years went by, I saw the changes in her when, first, she had to use a walker, then, a wheelchair and when she was bedridden. However, most of my memories are of the times when she was an independent woman, living in her own home. These are the memories I would like to share with you. I think it is the way she would want to be remembered as well. Family was of the utmost importance to Ma. 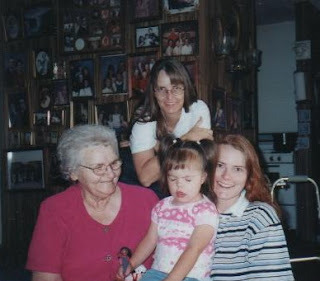 She loved to be surrounded by us. 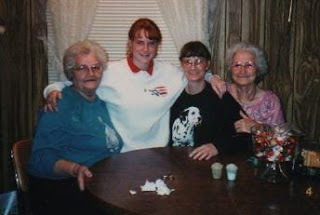 At the beginning of every month, we would gather at her house to celebrate birthdays and anniversaries with homemade cake and ice cream. Ma would hand out birthday cards with some money tucked into them. If you lived out of town, you'd get the card meant for you in the mail. It didn't matter if you were celebrating your 5th or 50th birthday, Ma always recognized you on your day. Thanksgiving and Christmas were also spent at Ma's house. Ma would cook, and cook and cook to feed everyone. Her house would be packed with people, but she wouldn't have it any other way. Under the Christmas tree was always a gift for each person present. She'd even buy extra presents and keep them in a closet just in case there was an unexpected guest. Ma wanted to make sure everyone was included. Ma's entire hallway is covered with framed photos of family, from about 3 feet off the ground to the ceiling. Just about every inch of space is taken. For the photos that wouldn't fit on the wall, Ma has a stack of photo albums on, under and in her coffee table. Even when I lived at home, I would take a walk down the hall to see the photos and I would spend time going through the albums. You never knew when you would see a new photograph. 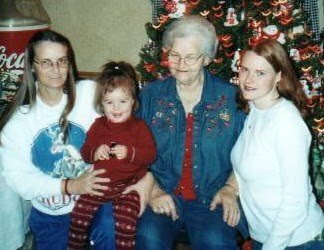 Every photo tucked into a Christmas card or letter found a place in Ma's home. When Ma moved into the nursing home, photos still arrived in the mail or delivered in person. She had two giant bulletin boards filled with photos. She also had a digital photo frame so she could still be surrounded by her family. Ma loved to crochet. From the time I was a little girl, I can remember Ma sitting in her chair with skeins of yarn at her feet and crochet needles in her hands. She made blankets, or pillows or pot holders or tissue box covers for everyone. She put so much care and thought into each piece too. One year, my sister and I received pillows from Ma for Christmas. Mine was pink and hers was purple, our favorite colors at the time. Graduations, marriages and births all warranted a blanket. During my senior year, Ma crocheted a beautiful blanket in the school colors. It was raffled off to raise money for Project Graduation. Some of my favorite memories of Ma revolve around getting her mail. When I turned 16 and got my license, I was like a lot of teenagers--I wanted to drive any chance I could. For years, my mom had been going after work to get our mail and Ma's mail at the post office every day. Using the guise of wanting to save my mom time, I volunteered to take over the errand. I'm sure my mom saw right through me, but I am so glad she let me start getting the mail. If Ma wasn't at home, I would leave her mail on her table. But if she was home, I got to spend some quality one-on-one time with her. She would always tell me to get a coke from the fridge and a snack. I always chose a Little Debbie oatmeal cake. Then, Ma and I would sit at her table and talk or we would sit in the living room while she crocheted and talk. I will always treasure that time spent together. 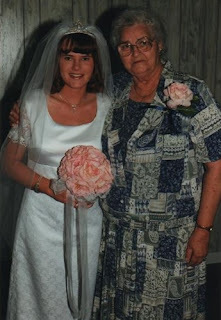 Ma was so much more than my grandmother. She hailed from Arkansas, but she was proud to be a Texan and especially proud to be a resident of her little town. 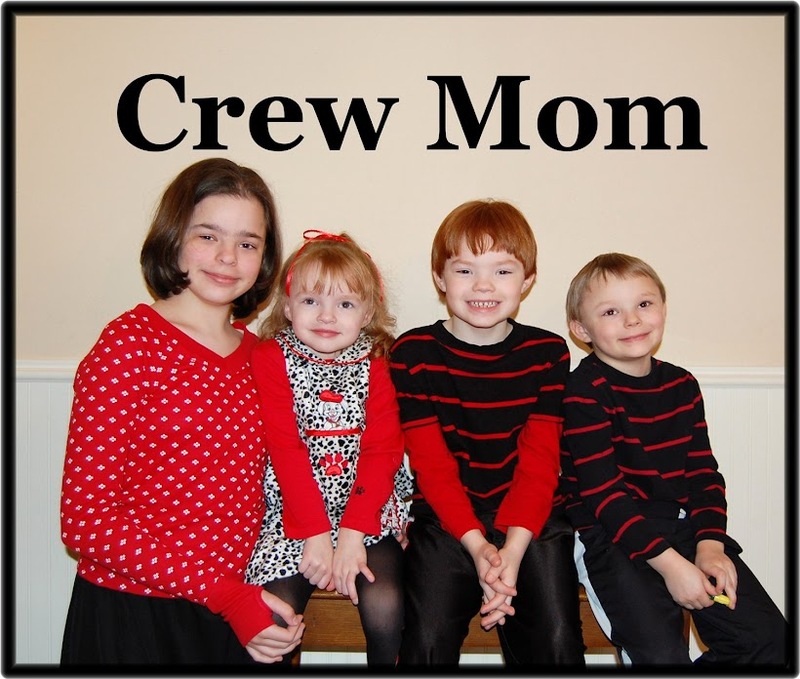 She was the first female on the town council and a charter member of a new church. 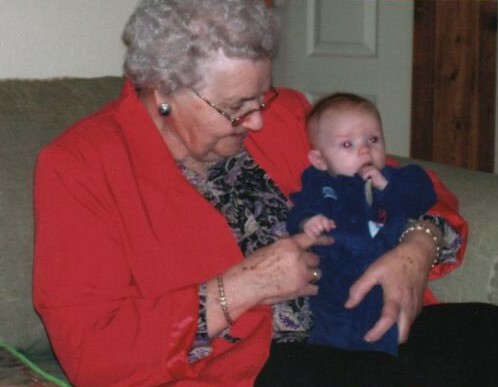 She helped open the town museum and she started the senior program at the community center. Ma wore blue jeans more than dresses. She had big feet (which I inherited) and was very tall (which I am not). She spoke her mind and was not afraid to let you know if you were out of line. She loved to watch Jeopardy! and Wheel of Fortune. Ma always smelled of Youth Dew, had a tissue up her sleeve and money in her bra. 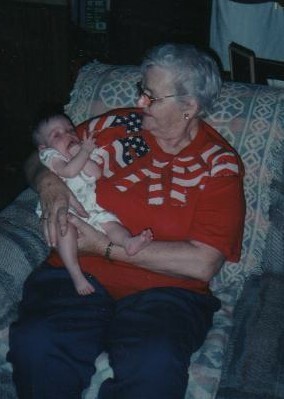 She loved to listen to Gospel music and George Jones. When it was on, she liked to watch Hee Haw. She sang at musicals and rode on floats in parades. Ma never sat on the sidelines and watched life go by. She lived it. Ma with me, my mom and her sister. By coincidence, when I was preparing to write this blog post, I came across our wedding video. As I watched it, I was reminded of something I had forgotten during the bouquet toss. I was standing, bouquet in hand, with all the unmarried ladies behind me. Off to the side, out of the camera's view was Ma. She said something to me about also being unmarried and everyone chuckled. I jokingly told her to come on and get behind me. Laughing, she shook her head "no". The count down began: 3.....2.....1... I leaned over and made a neat underarm toss right to Ma. She could do nothing but catch the bouquet. We had a re-toss, but the first one was the best. 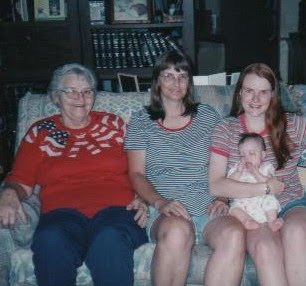 From the time Emily was a baby, we took a 4 generation photo when we could. Notice all the photos on the wall? Ma with baby Anna and me. Ma with baby Austin and me. This photo is out of order, but I wanted to save it for last. So, I leave you with this song, Go Rest High on That Mountain, written and sung by Vince Gill.